Citrix MetaFrame Access Suite or short just Citrix is a package consisting of a handful of key products that run on Windows Server 2003 and now also on Windows Server 2008. Citrix is a competitor suite to Microsoft's Windows Terminal Services. However, Citrix can go beyond what Windows Terminal Services itself offers. What Citrix is and how it works? 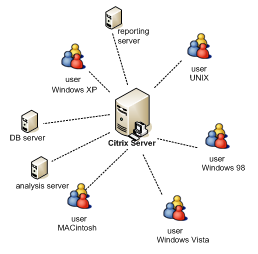 Citrix is a terminal server computing environment. Citrix provides the ability to access published desktops or applications through a web interface. Citrix provides the ability to publish a single application to a user's desktop where it looks like a local installation yet the process runs on the remote Citrix server. In other words, Citrix has the ability to virtualize user's desktop. Citrix gives users access to Windows, Web, and legacy applications, as well as other information, from anywhere, on any device, over any connection. The access is given via a central server. User logs into the environment. His or her keystrokes and mouse movements are transferred from user's workstation to the server. The server is where the application runs. The Citrix server sends screen updates back to the workstation. There are two major players in the market these days. It is Microsoft and Citrix. Microsoft offers so called Terminal Services component of Windows Server. Citrix offers their Citrix MetaFrame Access Suite. Whay is Citrix a good choice? In general, Citrix or MS Windows Terminal Services lets administrators install, configure, manage, and maintain applications centrally on a few servers. Having the ability to do these tasks centrally is usually much faster and easier to do than deploying applications on many computers at different locations across an enterprise. By Citrix making the administration of applications easier, companies save money on IT support. Centrally-deployed applications are usually easier to maintain. Let's look at for example patching and upgrading. It is easier for the resources administrator to maintain IT resources from his desk on one central server than have to walk over to each computer separately. Central administration of resources with the help of Citrix also results in reductions in downtime. When running a Citrix environment, all application logic runs on a central server. The processing and storage requirements for client workstations are minimal in a Citrix setting; therefore, older desktops can be kept in service for longer time, they can run legacy versions of Windows, they do not need as much storage, memory, and CPU as if they were running their own instances of software. What are the components in Citrix MetaFrame Access Suite? The Citrix MetaFrame XP Presentation Server is a Citrix's own version of Terminal Services. Citrix MetaFrame XP Presentation Server lets users connect any client device to any application running on the presentation server (that would be the terminal server in Windows terminology). This is where Citrix leads over Windows so much. It is its flexibility. While Microsoft currently provides Terminal Services clients only for Windows and Macintosh platforms, Citrix clients are available for Windows, UNIX, Linux, Macintosh, handheld devices, and many others. Citrix also provides a UNIX version of the Presentation Server. This allows for running UNIX and Java applications on a terminal server. These applications can be accessed from Windows clients. Citrix is very flexible and therefore suitable for large enterprises where the operating system environment is a heterogeneous mixture of Windows and UNIX. If the need is to run any application from anywhere, then the Citrix Presentation Server is an application that should be considered. The Citrix MetaFrame Secure Access Manager provides for role-based control over who can access applications and documents running on the Presentation Server. With the Citrix MetaFrame Secure Access Manager, access to applications is administered via an encrypted environment in an easy to follow tree-like interface. The Citrix MetaFrame Password Manager is add-on to the Citrix MetaFrame XP Presentation Server. The Citrix MetaFrame XP Presentation Server is used for single sign on (SSO) authentication. Using the single sign on (SSO) authentication, users only need a single password to gain access to a wide range of services and resources on Windows and UNIX servers. The Citrix MetaFrame Conferencing Manager add-on to the Citrix MetaFrame XP Presentation Server allows sharing of Presentation Server application sessions. This enables one application to be shared among users which makes it great for conducting online trainings. Independent Computing Architecture (ICA) is a protocol that the Citrix platform uses for transmitting keystrokes, mouse movements, and screen updates between clients and the Citrix Presentation Server. Citrix supports more platforms. Another advantage of Citrix is also a greater support for networking protocols. While Windows Terminal Services supports TCP/IP, Citrix supports also IPX/SPX and NetBeui. What is better -- Citrix or Terminal Services? Which tool is better for your business? Do you need the Citrix MetaFrame Access Suite, or will Windows Server Terminal Services be good enough? The answer depends on which you can sacrifice - time or money. Citrix is more flexible and more robust, but also more expensive. Both Windows Terminal Services and Citrix Presentation Server have their own licensing requirements. Both need to be licensed before you can deploy them to your users. Citrix generally tends to be more expensive. Even though you save money with Citrix on applications deployment, upgrading, applications licensing, client computer hardware and other places, it is important to consider the hardware on the terminal server. A Citrix server usually has to be top quality which means expensive. Citrix server also requires having a disaster recovery plan and quality support.